Support the development of the French brand franchise in the Canadian territory. Revision of the value chain retail franchise and retail department store. Comparative price positioning. Evaluation of the potential of development Through Quebec and all Canadian market with targeting of cities. Implementation of legal environment for the proper development franchise. Management and development of the marketing and commercial department of the whole structure. Opening the 80 stores fleet (between 5380 and 25800 sq. ft.) across France. Training of all furniture sellers appliances in store . Significant increase in sales after a few weeks with results above market figures . Developed a new store design concept and brand identity for national roll-out. Observation, training, coaching the team to develop sales of the "flagship" store Guerlain in Montreal. Observation, training, coaching the team to develop sales of Guerlain counter at the department store Ogilvy in Montreal. Making a retail training content adapted to the brand. In preparation for the opening of the new flagship store in Quartier Dix30, the client wanted a complete redesign of the space and cosmetic repositioning to service and high quality image. Trademark search, supplier evaluation, support for the creation of menu of care, appointment software, space planning resales and cabins (coordinating the work of the design agency), the selection of uniforms and table linens for the cabin space. Creation of a sales agency for perfumeries and pharmacies in Québec in charge of developing brands in selective distribution like Fendy, Krizia, Roger & Gallet, furthermore Diamancel, L’Air du temps, Paco Rabanne, ECScott, Mustela, L’Oréal and YSL parfums. Tight network and excellent contacts with retailers and distributors in the cosmetic business in Québec. Selection of products and sourcing prestigious brands on behalf of the new Canadian website. Accompanying and coaching for the project Céthial Média. A publishing company who publishes digital children educational books. Manage the franchise development for the brand. Find and qualify partners and locations accross Quebec. Coaching for the marketing strategy of the brand. Manages the development of franchsie in Quebec for these banners . Develop the necessary tools for the development and recruitment of new franchisees for the banner Presse Café in Canada and internationally . Organize and facilitate the franchise trade shows in Montreal and Toronto. Qualify and recruit franchisees. Find locations. Develop networks of agents on the Canadian territory . Organize the deployment in France, Europe and open the first Presse Café in Senegal. 17 openings in a year. Support and coaching of leaders and creators of a new concept of shop selling Cupcakes in Montreal. Marketing, sales and purchases strategies for the shop and its development. A vast portfolio of European (mainly french, belgian and spanish) and North American (quebecan and canadian) experts is available to meet all of your needs. This network is based on the concrete trust and field expertise of its members. With offices in Paris and in Montreal, M&R Consulting Group selects his experts regarding their operational experience and the quality of their network. Most of them have one or more activities. They are asked to intervene because of their pragmatic and efficient approach in confronting the challenges which are at stake and the goals that are to be reached. The market introduction of European or North American products requires a perfect knowledge of the sale and purchase cultures. Whether you are in Europe or in North America, adjustments to market regulation are necessary. That isn’t automatically synonym of harming or depleting the image or the brand of the product. The force of M&R Consulting Group is in markets with high added value. We are talking about markets where the product or the image of the brand is at stake and is part of the marketing strategy. This stake will make the difference on the market. The world of fashion, the world of home decoration (tableware, home furnishing and decoration textiles), the world of beauty or even the world of new technologies requires a specific know-how. This to have a maximum of visibility! Retail sale: The retail market is the most developed market in North America (Quebec and Canada). There are 4 principal cases: the department store, the supermarket, the warehouse, the specialized store chain and independent store. The retail market is very dynamic and competitive, always seeking for new products, new brands to offer. Because those new products or brands will bring him the added value, will difference him from his competitor, give him an image of innovation. Import and distribution: the European products are still synonym of quality for the North American consumer who is always looking for trendy products with refined design and quality. 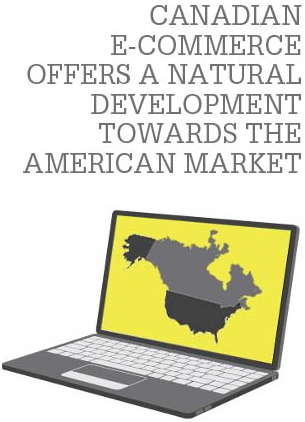 E-commerce: This is a growing market in Canada with a natural potential of development to his neighbor, the United States. The number of internet users is constantly growing: almost 25 million as of today (75% coverage! ).